Brides looking forward to a beach wedding should include the idea of flower girls. Their dresses are available and come in all styles and class. Beach flower girl dresses are easy to wear, weather friendly and do not absorb a lot of water or retain sand thus giving the young one easy movement while at a beach. They are available in different colors thus the bride suits herself with the best color for her wedding. Normally the beaches are warm due to humidity. Also, the nature of the location may only allow beach like wear. Straps, strapless, or open back dresses are preferred for such occasions. Tulle and lace are one of the most recommended fabrics for such dresses. With an additional of decorations, the dresses look elegant and expensive despite being pocket-friendly to many people. Here are some of the factors to consider when buying a beach flower girl dress. Light fabrics are a good choice for such dresses. Chiffon, lace, and tulle are favored by many designers and buyers. A lace bodice and tulle skirt is a common beach wear for weddings. There may be additional ribbons to improve the appearance of the dress. Chiffon is quite easy to clean and does not carry large amounts of water and sand. Therefore, you will not be afraid of the young ones getting wet while playing along with the beach. The final touch of decorations gives a better impression of the dresses. Some have sequined decorations while others have pearls hand fixed. Other types of beads are also fixed on some dresses according to one’s choice. A removable triple flower sash or bow sash improves the details of the dress. White is the most common color but there are no restrictions to what one can wear. Brides have gone for baby pink, ivory, white, and champagne amongst other colors. If the colors complement the wedding theme it is a welcome idea. However, avoid colors that reflect the sun or will appear dull in the photo shoot. Most of the dresses are Tutu style and formal. They are usable for other occasions like birthdays, baptism, children parties, holidays and photo shoots. The sleeves may either be long, short or sleeveless. Also, the length of the dress is determined by the bride according to her preference. However, children develop very fast. It is therefore wise to buy something they can wear for a longer period of time. Every coin counts on what you purchase. Consider the durability of the dress and toughness against wear and tear. 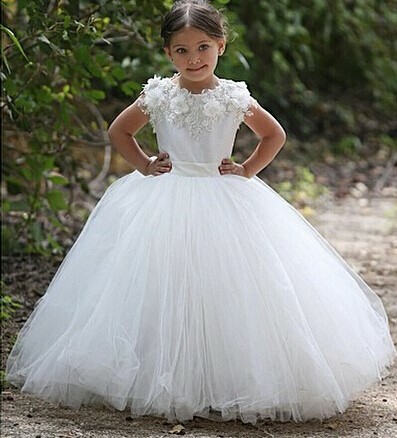 In the event of parents will purchase the dresses for their little ones; do not go for highly priced dresses since not everyone can afford such a dress. Flower girl dresses are used for different occasions. Therefore when purchasing her dress, select what she can wear to birthday parties and other children occasions. White dresses are commonly used during christening occasions and an elegant dress will serve the purpose. If the dress is a little more open on the bodice, consider buying a jacket, bolero, or sash to cover up in church service.